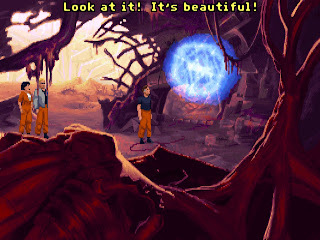 After playing Death Gate it was time to change the setting from fantasy to science fiction. 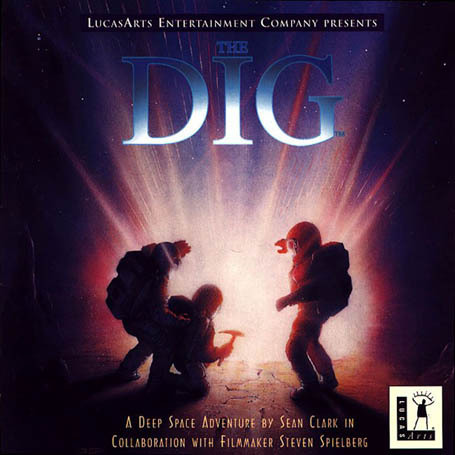 The Dig is an incredible science fiction story based on an idea Steven Spielberg had (yes THAT Steven Spielberg). Originally he wanted to make a tv episode and later a movie about it but it was deemed too expensive. 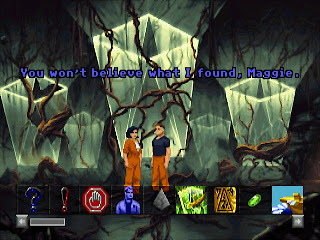 Fortunately instead of staying unproduced it became a 1995 adventure game by Lucas Arts. When a radio telescope detects an asteroid on a collision course with Earth, an expedition is sent to save the planet. The plan is to place two nuclear devices on the surface of the asteroid (named Atilla) to change it's course and put it in a stready orbit around Earth (making Attila Earth's second moon). 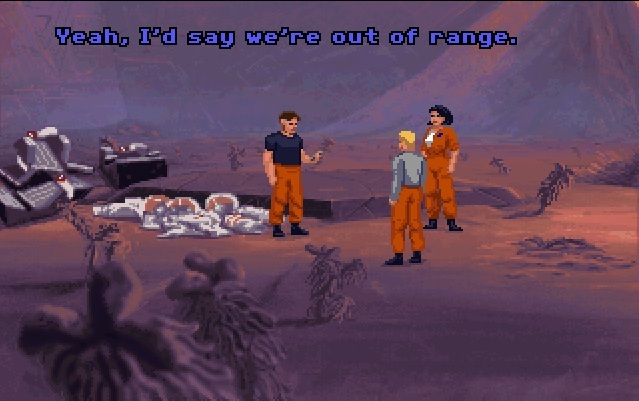 As you can imagine things don't go exactly as planned and three of the five team members end up stranded on an alien planet. You play the role of Boston Low, commander of the mission (voiced by T-1000 himself, Robert Patrick). With you, are Maggie Robins, a reporter and expert in linguistics and Dr. Brink Ludger, a noted geologist and archaeologist. Together you have to fight to survive on a deserted alien world and try to find a way back to Earth if there even is one. I don't want to say too much about the story because it would spoil it for you. I will just say that it is one of the best science fiction stories ever told in any medium that explores some great philosophical thoughts. But of course that is the case will all good science fiction. The interface couldn't be simpler. When you see something of interest, you left click to interact with it. There is only one button to the bottom left side of the screen that brings up the inventory (right click does the same thing). When you talk to someone you don't choose exact phrases but rather ask a question, make a comment and talk about various topics represented by appropriate images. Pretty simple stuff. Most of the puzzles are quite easy but there are some that will leave you scratching your head. 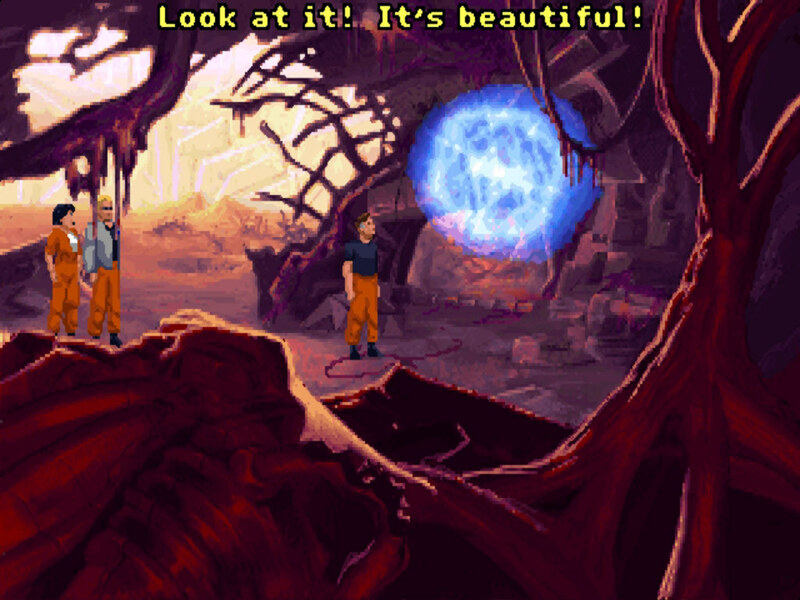 Any science fiction fan should play this game and if you're reading this blog odds are that you love science fiction. So head over to Steam and buy the game for an ultra low price of 1.99 euros (50% off). A great game on a great price. I really hope that one day it will also make a great movie. Yes, I think I will have to give it a go. It seems brilliant! Since its release i have played Dig two times. Now that you reminded me the game again I think i might play it for the third time. It is like like a good movie: every now and then you wanna re-experience it. Good choice for retro holiday titles!